A web application that provides real time space availability information for the largest Bath Car Parks. The application also provides, for each car park, a simple one click action to open Google Maps in GPS mode with relevant road directions from your current location. Our main dataset is the BANES Live Car Park Occupancy although we are currently looking into integrating additional information taken from the BANES council website. None! It was all fun. Socrata is very easy to work with. 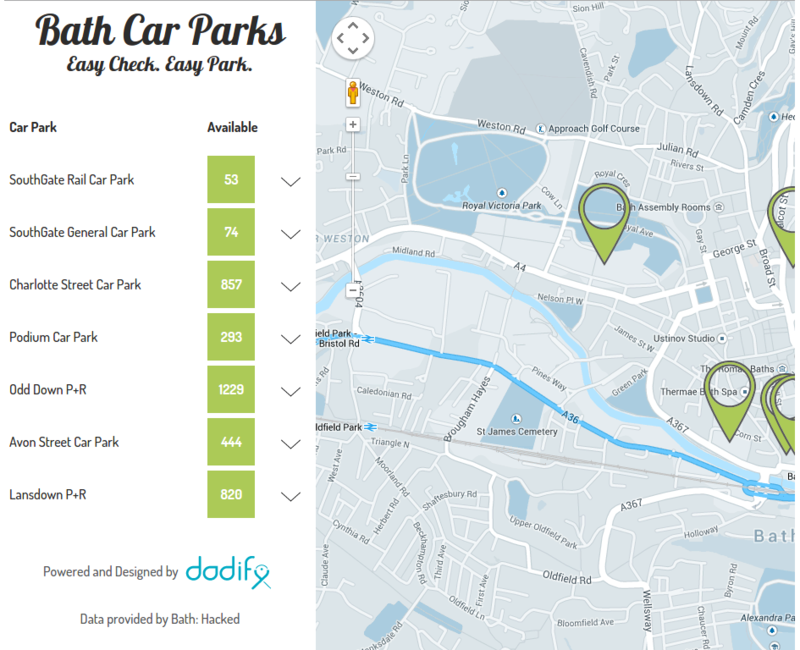 For each car park we are going to add pricing information. We are also planning on adding car parks for which we do not have live data. Finally, usability can always be improved. If you like/understand regular expressions, you can find the application by inserting in your browser address bar any string that matches (www\.)?bathcarparks?\.(((co\.)?uk)|com). Otherwise head over to http://www.bathcarparks.co.uk.